Ananas Noire translates "Black Pineapple". 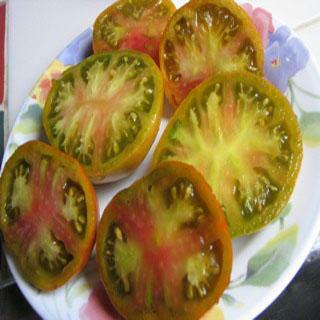 It is a stable cross from a tomato patch in Belgium between a black variety and Pineapple, a bi-color. Heirloom Seed Packet. Ananas Noire translates "Black Pineapple". This variety is very exciting and winning the praises of heirloom enthusiasts! It is a stable cross from a tomato patch in Belgium between a black variety and Pineapple, a bi-color. It owns the strangest color combination I've seen to date, red- yellow-purple-gray-green, a real rainbow of color swirls. However pretty it is, it's flavor stands tall also. It is simply delicious!